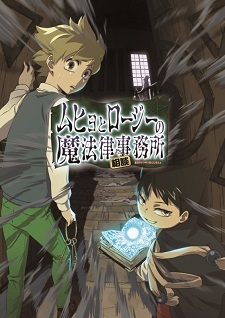 The 16th 2018 issue of Shueisha's Weekly Shounen Jump has revealed that Yoshiyuki Nishi's Muhyo to Rouji no Mahouritsu Soudan Jimusho (Muhyo & Roji's Bureau of Supernatural Investigation) manga will receive an anime adaptation. The anime will premiere on BS Sky PerfecTV and Animax this summer. The comedy supernatural manga ran for 18 volumes in Weekly Shounen Jump between 2004 and 2008 and was later compiled into ten e-book volumes. Shueisha published a two-volume novel adaptation by Saya Amou in August 2007 and December 2008. Nishii is launching a sequel manga on Shounen Jump+'s website on Monday. VIZ Media licensed the series in English and published all 18 volumes from 2007 to 2010. Dang, it's about time. I had given up on this getting an anime. Yes!! One of my favorite mangas finally gets an anime. Well, there's a decent amount of volumes so they could at least make this into a 2-cour. Might be interesting. wow WSJ from 10 years ago. many old manga getting adapted recently, nice. Looks like one of hidden gem manga got adapted. Sypnosis kinda sounds funny and the PV looks neat as well. Might take a look at manga first. Nice! I love this recent trend of older/completed manga getting anime adaptions over the past couple years. The Japanese have been wanting a Muhyo & Roji anime for a good while now. And with the manga also getting a sequel, I guess an anime adaptation was bound to happen. But still, what a pleasant surprise! I remember the manga being fairly solid when I read through it a few years ago, so I'll definitely be giving the anime a shot. I wonder how many episodes it'll go for and which studio is adapting it. The key visual and trailer look promising, at least. Well, I'm adding my first and main seasonal this summer. Neat. Awesome!!! Never thought this series would get an anime adaption, love the manga, can't wait! And a manga sequel, sweeeeettttttt!!!!!!! Yet another finished manga getting anime. This one ending 10 years ago. Cool. Well, I'll check out the manga first. Now I can understand all the fuss about it.